It crams in too much and skips salient issues but this jukebox musical still ends up being a lot of fun. A sequin spangled disco diva extravaganza, Summer: The Donna Summer Musical, is many a disco fan’s dream singalong. 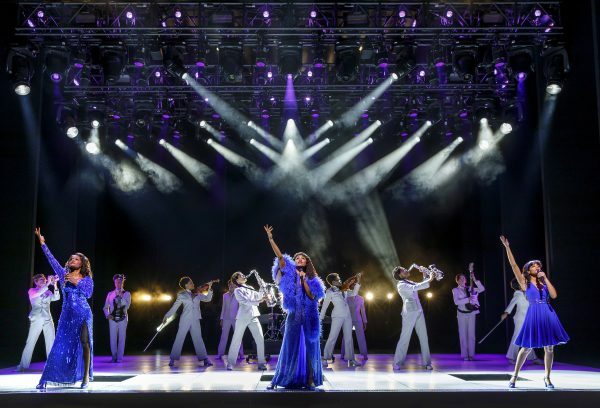 While it outlines the main events in Donna Summer’s too short life and delivers many of her best songs with superlative singing, the show is as much about what it leaves out as what it crams in. Donna Summer’s story is full of the classic superstar struggles including loneliness, drug dependency and PR gaffes but the dark side is so coyly and politely tackled that this portrait remains resolutely superficial. Yet for all its narrative shortfalls, it’s a joyous, thrilling night out with excellent leads and an energetic ensemble cast, that will make you yearn to dance like no one is looking. Donna Summer first writhed into music history with her 1975 hit “Love to Love You Baby,” her orgasmic disco sensation that featured a lot of moaning and heavy breathing. Radio stations thought it too risqué to play, but it was a such a hit on the dance floor that it was re-released in a 17-minute version – close to disco nirvana. By the time we reach this turning point in Donna’s career in the show, we have plodded through her early years with the three women who play the star at different stages of her life. LaChanze brings inimitable star power to her Diva Donna. Ariana DeBose is sultry and a superb singer as Disco Donna. While newcomer Storm Lever embodies the awkward teen years of Duckling Donna. The tripartite device allows for some killer musical trios for some of the songs but is used in an obvious fashion for most of the show with all three dressed in the same royal blue – in case you forget they are all the same person. It gets even more confusing when LaChanze plays Donna’s mother – still dressed in blue. Costumes, by Paul Tazewell are generally spot on for the era with ample sequins and even the ensemble at one point all dressed in the Seventies staple—the Diane von Furstenberg wrap dress. But back to “Love to Love you Baby” – Donna recorded this song in Germany where she had moved to join the cast of the musical Hair. Legend has it that to achieve a realistic level of orgasmic ecstasy in the recording, she lay down and asked the recording engineers to turn their backs. But like many of the crowd-pleasing moments and songs of this show it is cut short before we get too excited perhaps. Another megahit “On the Radio” also gets subpar billing. It is one of the most iconic disco hits of all time yet here we are treated to Donna in her car doing a version of Carpool Karaoke. What is strangest about this scene is that the cars and the vibe are anachronistically retro—more 1950s than late 1970s. The scene allows for a stage “car chase” that brings Donna together with her second husband Bruce Sudano, played as a Henry Winkler as Fonzie lookalike by Jared Zirilli. The stage design with stylish use of moving video screens, struggles bravely to keep up with the whirling pace of the too frequent biographical milestones with busy set changes for scenes that last moments. But wait for the divine disco finale to see what extraordinary lighting design (here by Howell Binkley) can bring to a show. There is an unfortunate overuse of the ensemble miming with musical instruments – trumpets, guitars and line of violins are all brought on as props when more of the superb disco formation dancing (choreography is by Sergio Trujillo) would have been more satisfying and less clunky. And yet, despite the rushed nature of the story, the over-crammed narrative, and songs getting the short-shrift, I found myself loving this show because the three stars knock the songs out of “MacArthur Park” and are such “Hot Stuff.” There are nods to current issues like the #Metoo movement through the songs such as “She Works Hard For The Money” and “Bad Girls” and gags about unequal pay; ”There’s a rumor I’m a man, if I was I’d be paid more,” quips Donna. The ensemble is also nearly entirely female, with male roles routinely played by women. But however, forward thinking the casting may be, Donna’s notorious homophobic outbursts in later life are given throwaway treatment as if offending a large portion of your fan base was just a slip of the tongue. Donna’s early sexual abuse at the hands of her Church’s minister is also brushed over, keeping anything unsavory off-stage. This Donna in all her three personifications is a superwoman, standing up to sexism and corruption in the music industry and fighting for equal pay for equal or better work. And whatever you learn about Donna the woman, you will be hard pressed to resist the power of her songs. Saving one of the best for last, the show ends in a shower of glitter, and the entire audience jumping to their feet to boogie on down 70s style to Last Dance. The audience could have danced all night. The main complaint as the audience headed out was that not enough of her famous hits were included—and there are 23 songs in the show!